In an article in the December 2016 Edition of Modern Railways about the Heathrow Southern Railway, Chris Stokes proposes a service between Weybridge and Heathrow Terminal 5 stations. With the addition of a chord at Staines, it would also be potentially possible to operate a half-hourly Weybridge – Virginia Water – Egham – Terminal 5 service, providing a further attractive local link to Heathrow. In this post, I will look at the various issues associated with this proposal. Currently, Weybridge station is serviced by the following trains on the South Western Main Line. Four trains per hour (tph) to London Waterloo. Two tph to Basingstoke via Woking. In addition two tph use the Chertsey Branch Line to go to London Waterloo via Virginia Water, Staines and Hounslow. This Google Map shows the staion on the South Western Main Line. Note the train that will use the Chertsey Branch Line in Platform 1, which shares an island with the London-bound Platform 2. This would have been convenient for me, as I arrived from Woking, with the intention of taking the branch line to Staines and Feltham. But as there are only two tph on the Chertsey Branch, I had to wait twenty-five minutes. Luckily, the train has a long turnround at Weybridge, so I was able to sit in a comfortable seat for much of the wait. The bridge is an interesting structure, which has a set of new lifts. Wikipedia says this about the use of the station. Up and Down platforms serve the slow lines; there is a bay platform on the up side, from which trains operate on the Chertsey or Weybridge Branch of the Waterloo to Reading Line. Stops on this line include the main towns and villages of Runnymede and it gives Weybridge’s longer route to Waterloo via Staines. This service can also be used to provide a cheaper and quicker route to the Great Western Main Line, by changing at Virginia Water for the service to Reading, Berkshire from Waterloo, for passengers on or by the South West Main Line but not near the North Downs Line. In the middle of a wet Thursday, there weren’t many people waiting for a train for the Chertsey Branch. 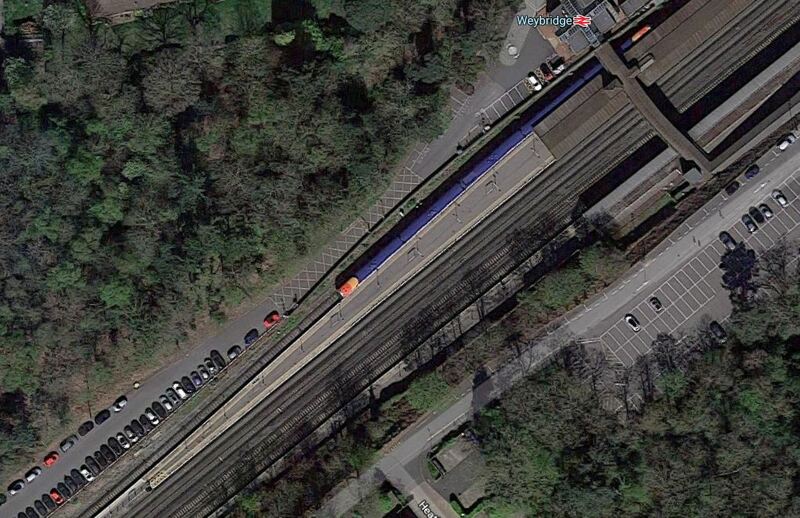 This Google Map shows the station and the triangular junction between the South Western Main Line and the Chertsey Branch. 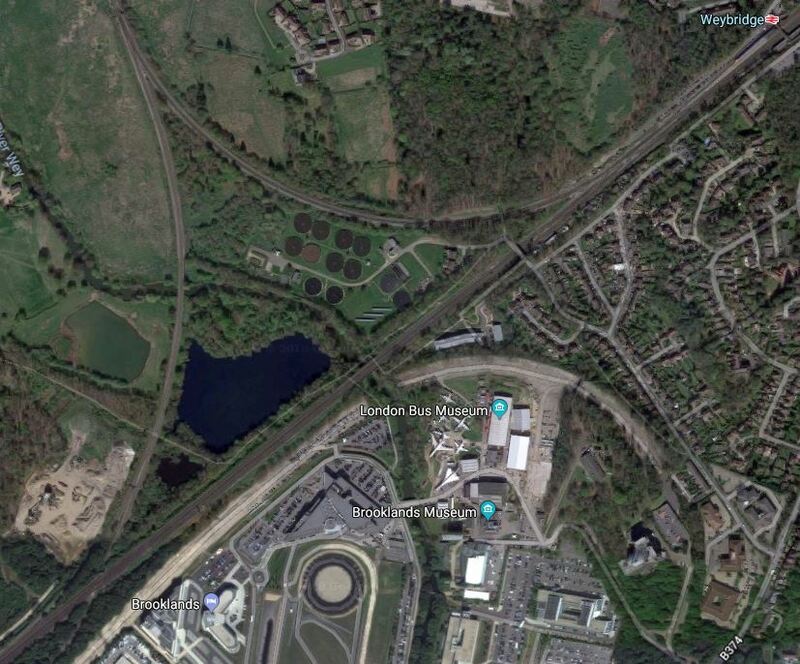 Note, the historic motor-racing circuit of Brooklands to the South of the South Western Main Line and the triangular junction. The connection between the Chertsey Vranch Line and the South Western Main Line is a flying junction, so I don’t think there’ll be any issues with Heathrow Express trains using Heathrow Southern Railway’s new railway to Woking. Going towards Weybridge and London, there appears to be a single track connecting the Chertsey Branch to Platform 1 in Weybridge station. There may be need for small changes to the track, but this simple layout should be able to easily handle four tph. Looking at Real Time Trains, shows that in the hour I travelled, only four passenger services passed, through Addlestone station on the branch, with three other freight and stock movements. So it is not a busy line. If Heathrow Southern Railway is built and Heathrow Express runs to Working, passenger trains in each direction will become. 2 tph – London Waterloo to Weybridge – Calling at Addlestone, Chertsey, Virginia Water, Egham and Staines. 4 tph – Heathrow Express – Non-stop between Terminal 5 and Woking, joining the Chertsey Branch Line, just to the North of Chertsey station. 2-4 tph – Freight trains and stock movements. There would appear to be enough paths to squeeze in two extra trains between Terminal 5 and Weybridge, which call at Addlestone, Chertsey, Virginia Water and Egham, and use the new chord at Staines, that I talked about in Heathrow Southern Railway’s Proposed Chord At Staines. Should Services Between Weybridge and Terminal 5 Stop At Staines? This would need a platform or platforms on the chord. This Google Map shows the area of the chord. There is a vehicle ramp to gain access to a multi-story car park. Much of the space to the East of the ramp is surface car parking and in my view, wasted space. There appears to be a bus station. 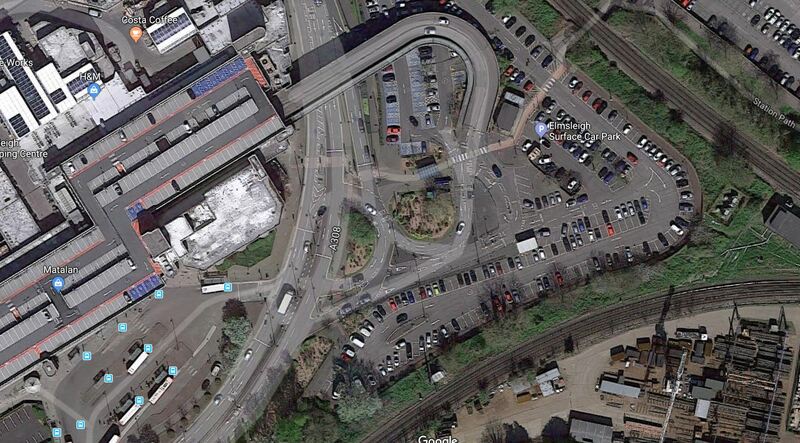 I think there is sufficient space to create an innovative transport interchange. It could even be very simple. Single platform long enough for one of South Western Railway’s five car Class 701 trains, which are possibly around 120 metres. Walking routes to the bus station and the main station. The most complicated piece could be a step-free bridge to the rest of the station. Heathrow Terminal 5 station was built with two Westward-facing terminal platforms. As each has a capacity of probably four to six tph, there shouldn’t be any problems of capacity. A Weybridge to Terminal 5 service seems a serious possibility. But I can’t help wondering, if it should be four tph and the direct service to Waterloo via Chertsey should be discontinued. But a platform at Staines to interchange should be provided. I’ll be interested to see the final proposals. Realistically, how many people will be going from Weybridge, cherset, Addlestone, VW or Egham to Heathrow on an hourly basis. Assuming 2/4 tph from Heathrow to Woking (2tp onto Gatwick via North downs and 2tph onto Southampton or Portsmouth) and at least 2tph from Heathrow to Waterloo via Staines–all of those stations would be able to access Heathrow through a single change in Staines. Given most people on the Staines-Reading line are commuting to Waterloo, not to Heathrow, this must be a better use of the Heathrow lines? If there is extra capacity and a South facing link from Heathrow towards Egham, I’d suggest a route to Farnham or Alton via Camberley- a route with spare capacity which wouldn’t replace a commuter line. I have read the full HSR proposal and it stacks up. One of elegant bits, is that it extends Crossrail to a new bay platform at Staines, which will be very good for the workers at the airport, as well as passengers. It’s not all about passengers.